Residents nearby thought it was an earthquake, but it was a Mercedes G Class which fell from 3rd floor. There are freak accidents, and then there are some. So, when a car crashes three floors down, you can hope for the best but are prepared for the worst. When a Mercedes G-Class crashed through a road facing glass wall of a parking garage, it went three stories down. By the time the car settled on the street below, it had left a gaping hole in the wall, knocked down a fair bit of concrete that held that particular section of the wall together, and had itself turned on its roof. And while one doesn’t expect to walk away from an accident unscathed, considering the magnitude of the crash landing and steep fall, the driver has in fact walked away with a minimum of injuries. Upon incident he was taken to a nearby hospital and is reportedly alert and talking, and in stable condition. 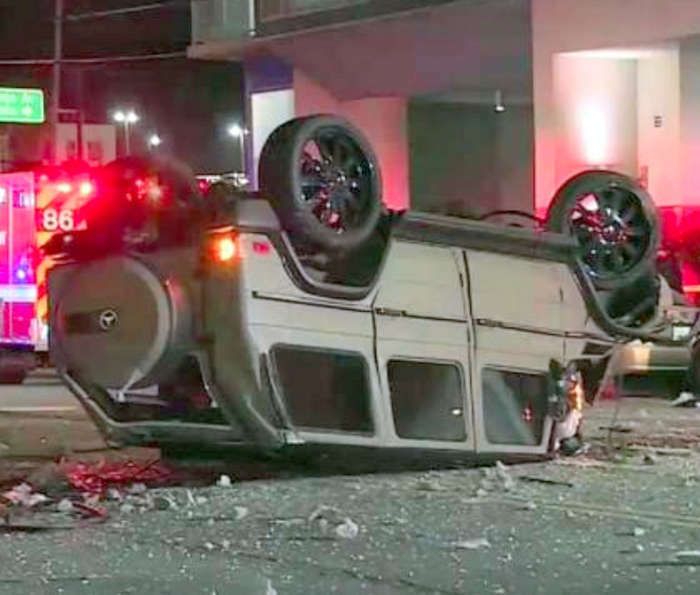 The incident was reported at North Hollywood, Los Angeles, California, and while the situation could have gotten scary much, no other person was harmed, and no vehicle destroyed. And that’s a big relief since the incident spot is on a busy LA boulevard. This wasn’t a case of drunk driving and preliminary investigation suggests the driver stepped on the accelerator instead of brake pedal causing the vehicle to dash forward, break the wall upon impact, and hurtle down. Mercedes G Class is one of the most powerful cars from the company. Mercedes also claims that it is one of the strongest cars on offer in the world. Not many would argue that, especially the driver of the G Class above.